A remote control Bedford Milk Float is then summoned by another walkie talkie, this time in the steering wheel of an E-Type Jaguar. It gets better... The Milk Float is being driven by a woman in the secret baddie’s lair on a simulator, with a Scalectrix model for directional help. Marvellous. 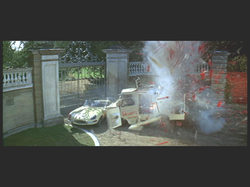 Except, yes, that is an E-Type Jaguar that is also being blown up. Remote Control cars may be readily available now but in 1967 this was actually a cutting edge idea. The first commercially available Radio Controlled Car was not available in the UK until Italian company Elettronica Giocattoli introduced a model Ferrari just in time for Christmas 1966. Well, just in time for Atkinson’s Toy Shop in Swansea, anyway. They were first displayed at the Milan Toy Fair in 1968. As the film came out in 1967, it is likely to have been considered a pretty great section of the movie. For James Bond's 50th Anniversary celebrations a variety of gadgets and toys were released. Included among those, are sadly, no Milk Floats, which was a shame because we have actually seen two deadly Milk Floats in James Bond movies. They did however bring out a Scalextric Set and three classic Remote Control Bond cars. These are the best prices we could find. Just click on the images to open a new box and find out more.